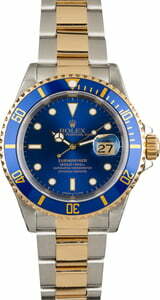 A highly desirable variation of the Rolex Submariner Date is the two-tone ref. 16613 that is presented here today. Not only is this sports watch versatile, but it also offers gold accents at a mid-level price. The Submariner was initially developed as a diver's tool watch but has since grown in popularity among collectors who seek bold yet functional statement pieces such as the two-tone Submariner. 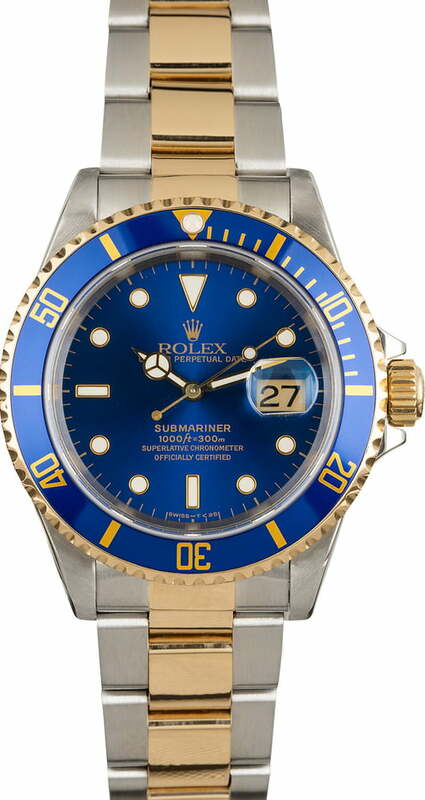 This used Rolex 16613 pairs the steel and gold finish of the Oyster case and bracelet with a contrasting blue bezel and dial, creating a nautical style that complements its origins as a dive watch well.